There are diffrent ways to get rid of that unwanted tattoo. But this is the latest one. I’m talking of ‘dermapricking’ which differs from dermabrasion in poking instead of pealing. Ironically the tattoo gun is used in the removal process. It costs around a few hundred dollars. 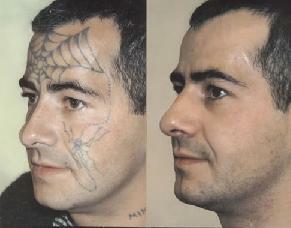 The skin is pierced with the tattoo gun needle 3000 times per minute to bring the pigment on the surface. The pigment is than re-dyed to its natural color. The bee sting of the dermapricking doesn’t hurt. Though the process is time consuming, it lightens the color completely. The final results of any tattoo removal depend to a great extent on the skin type. One method which may give good results on your skin may play havoc with the other. Consult your tattoo artist and the dermatologist before finalizing the method.